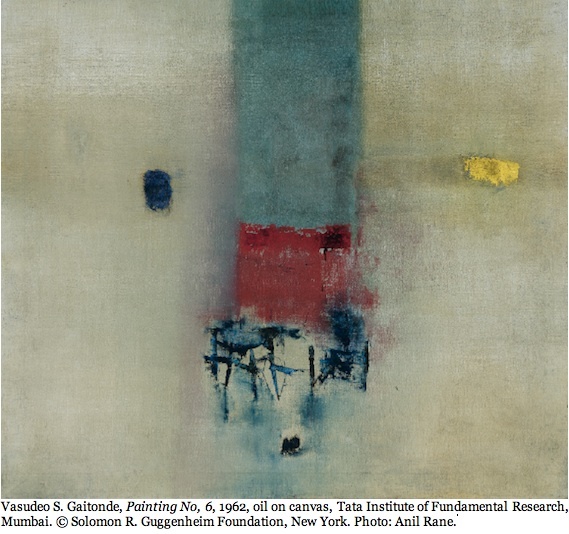 V. S. Gaitonde: Painting as Process, Painting as Life will be on view at The Solomon R. Guggenheim Museum in New York from October 24, 2014 to February 11, 2015. For details consult the museum website. Among American museums, The Solomon R. Guggenheim Museum in New York leads in the expansion of the Modernist canon of art history. In the last decade, the objective of its administration appears to be oriented toward making The Guggenheim more inclusive of non-Western Modernist art by acquainting art audiences, bit by bit, with the artists who have made an impact in the cultural centers that have emerged in Asia, Africa and Latin America over the last three decades. In the case of Vasudeo S. Gaitonde (1924 - 2001), a painter of beguiling light and space suggesting metaphysical speculations on creation, perception and the permutations of the mind, once the global auction circuit got wind of the Guggenheim's plans to mount a retrospective for the Indian master, Gaitonde's paintings, drawings and prints began to command record sums. In December 2013, an untitled oil on canvas sold for 3.7 million US dollars (Rs 23.7) at Christie's Mumbai, establishing a new world record for an Indian modern master. Often market trends are fickle, but for Gaitonde, whose contribution to abstraction is a translucency of light arguably unseen since the Renaissance and Baroque development of sfumato and chiaroscuro, the flurry of interest in Gaitonde's work around the world has sustained steady gains at the auction block. 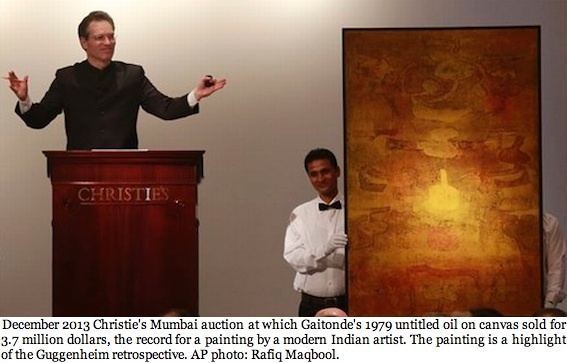 In fact, investment sources have cited that since the Mumbai auction, Gaitonde has become the second-best performer in contemporary art world wide, while having a stimulating effect on the Indian market in particular. All of this, and still the Guggenheim errs on the side of caution in supplying the Indian master only a suite of small side galleries -- not a place on Frank Lloyd Wright's beloved circular ramp. The tight viewing space in no way diminishes the art's impact or the viewers' experience of paintings that count among the most technically adept and exquisitely rendered compositions of Modernism, particularly those painted in the 1970s and 1980s. So impressive is the selection, hardly anyone who doesn't come to the Guggenheim with an eye out for the history of eurocentrism in Western museums will notice that the Guggenheim is gently politicizing the public's knowledge of Modernist painting with the embrace of an artist whose generation ushered in the age by which the colonized peoples of the world threw off their colonizers. In many senses Gaitonde's neglect by the Western art world all these years signals that the echos of colonialism are still being played out today in the global market place and particularly in cross-cultural exchange. But is it time to forget such divisions when the Western markets and institutions for art are only just becoming inclusive of the art of diverse cultures? Guggenheim curator, Sandhini Poddar, openly acknowledges in her catalogue the assimilation of "Polymorphic Modernisms". But the emphasis remains on the recognition of Gaitonde's embrace of the Western Modernist paradigm, when, truly, Gaitonde's paradigm for abstraction -- and for that matter the indigenous productions of countless artists like him around the world -- is much more than modernist or Western in the sources it springs from. For while it is true that the painter born in Nagpur, and who spent most of his reclusive life in Delhi, came to embrace the Euro-American paradigm of abstraction, it was only after he studied the formal attributes of the great range of India's historic paintings, a legacy that stretches back nearly two millennia. Gaitonde also studied other Asian and Western art histories and metaphysics, both as a student under the British in the early 1940s at the JJ School of Art in Bombay (now Mumbai, and named for the Parsee businessman and philanthropist, Jamsetjee Jeejebhoy). 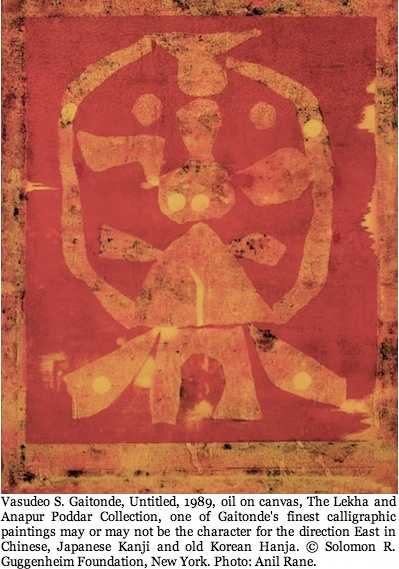 The impact of this diverse cultural legacy on the artist was more than lasting, as it informed Gaitonde on both how to depict the process of perception itself on canvas, and how to embody, through the actions of the painter, the cycle of human cognition that begins with our observation of things that are apart from us, accumulates every conceivable knowledge of the world, and in turn -- and this is the Zen part -- turns the materiality of the world into a mirror of the structure of the mind. In fact, Gaitonde's painting may be the most significant bridge between the present day culture of India back to a time before India had become beset by the many colonial incursions imposed on its artists and civilization. For when we stand back to see Gaitonde's life and work set against the background of India's continuity as a civilization, we can see traces of the histories of Indian art and thought extending back to the earliest intellectual stirrings of the Indus Valley civilization (in Gaitonde's calligraphic mimicry of indecipherable scripts), continuing through the epochs of the Buddhist cave murals, the various Jain, Islamic and Hindu schools of miniature painting, and the figurations and realisms of the Nationalist period. This much we know despite Gaitonde's legendary silence on matters pertaining to his work from his friends and associates. 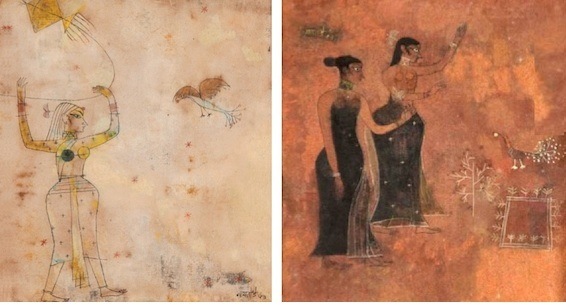 The Indian art historian, Meera Menezes, informs us in a forthcoming book, Vasudeo S. Gaitonde, A Biographical and Comparative Research, that, "it was thanks to the influence of two teachers at the JJ School of Art, Shankar Palsikar and Jagannath Ahiwasi, that Gaitonde paid great attention to Indian miniatures, among them the Basohli and Jain schools. Basohli painting was a school of Pahari miniature painting that flourished in the Indian hill states during the late 17th and 18th centuries. 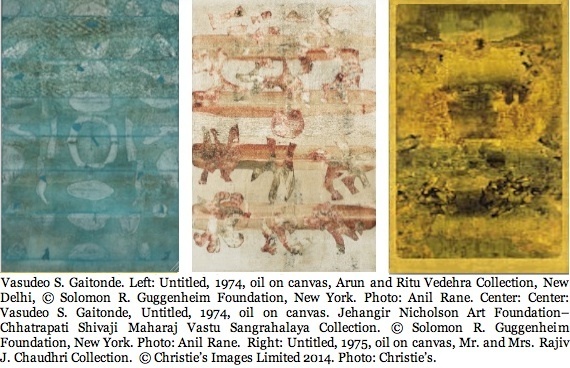 Gaitonde spent hours copying them and their bold use of color and line provided him with new insights." Menezes also notes that Palsikar's extensive quotation of The Upanishads made a significant impression on Gaitonde. Then there is the legacy of Indian art that shows through Gaitonde's modernism to those who have studied and enjoyed it. 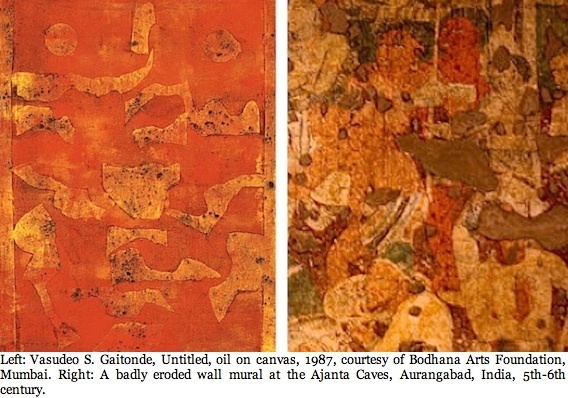 The Indian art critic, Roshana Shahani, may be the first to have seen glimmers of the Indian Buddhist cave murals of Ajanta in Gaitonde's work made throughout the 1970s and 1980s. 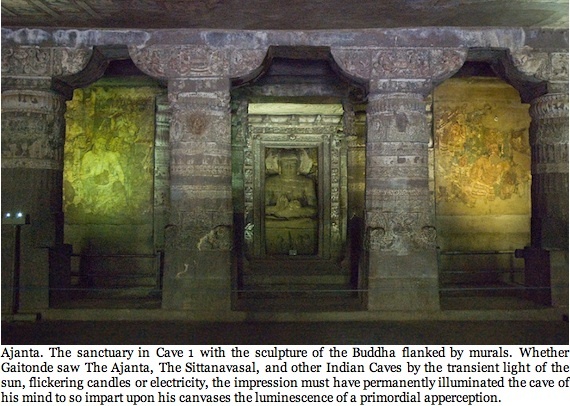 I personally see in Gaitonde's late paintings reflections of the murals hidden within the Jain temple cave of Sittanavasal. Several of Gaitonde's paintings of this period appear to be caught within the shafts of sunlight that cascade across the back walls of caves while illuminating the colors, outlines, and surfaces of the eroded and chipped layers of what remains of the 1500-year-old painted cave murals. In this allusion Gaitonde seems to have simulated the material evidence of the injuries of time's passage inflicted on the frescos and stone surfaces they are painted on. With or without this source of the cave as his departure, Gaitonde's non-objective paintings of the 1970s and 1980s make Plato's Allegory of the Cave come alive for us. Yet they do so in inviting us to project our interpretations of what we see onto a compositional informe -- that is onto the perception of form without anthropomorphic identity, form which may or may not still be in the process of formation, while resembling only suggestions of objects, not recognition of objects. It seems that for Gaitonde, as for Plato, the cave is analogous to the mind and its apperception of the world outside it. In this analogy we may regard light to be the shared medium of the mind and of painting. 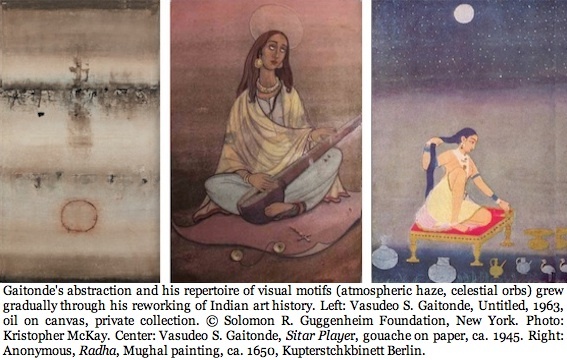 But in associating Gaitonde's paintings with Plato's interpretive mind, we are also retracing the exchange of Indian, Persian, Egyptian and Greek philosophies that transpired along the Eurasian-African trade routes as much as four millennia ago. Even were we to remain oblivious to this history of art and perceptual/interpretive philosophy informed by a mingling of The Vedas from India and the Pre-Socratic and Socratic thought of Persia and Greece, Gaitonde's paintings of light and the role generally of light in our perception and recreations of the world and the mind together are so uniquely Gaitonde's that his art, particularly that made since 1960, can no longer be misconstrued as either Indian and ancient or derivative of Euro-American modernism, as light and painting alike have so profoundly informed the ways of thinking and seeing shared by all cultures, modern and ancient. After tiring of his enterprise of capturing light within paint, calligraphy and its relationship and resemblance to written language came to fascinate Gaitonde, or more accurately the written forms by which languages spread and signify. In fact, it was the form of written languages whose meanings are not yet deciphered that most fascinated Gaitonde. 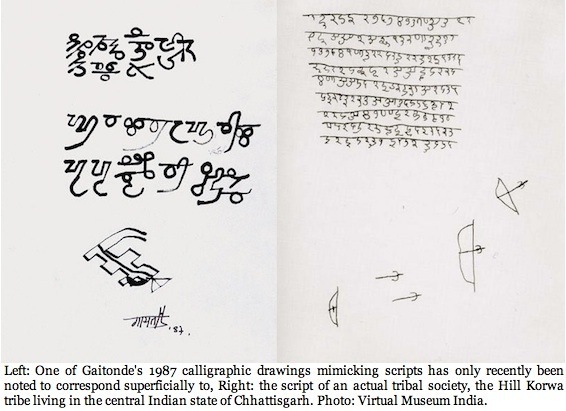 In the late 1980s and 1990s, Gaitonde searched for his inspiration in the script of living post-Neolithic -- or what we commonly call tribal -- societies. We don't know all his sources or how much was self-generated, but we can see in at least one of his calligraphic compositions the influence of the Hill Korwa Tribe extant in India today. 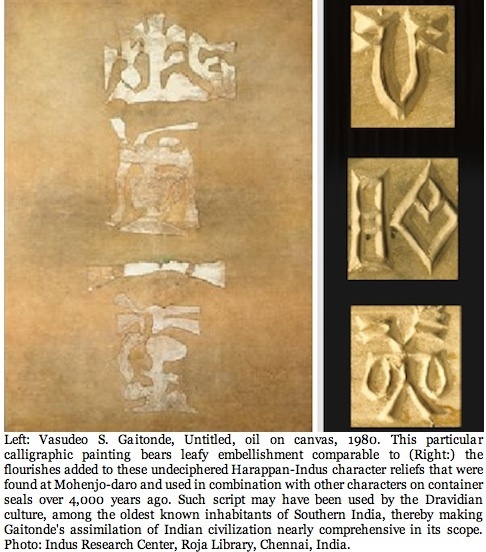 The resemblance of some of Gaitonde's calligraphic characters to the Indus Valley or Harappan script is unmistakable -- which by its frustration of all attempts to translate and interpret the 4,000-year old writing remains an abstract if compelling enigma -- a formal system without known referents, only structure -- to a painter of non-objective motifs. Such sources indigenous to India convey that Gaitonde was to become a universalist in sensibility and idealism. For it was the diversity of the Indian subcontinent's cultures, faiths, ideologies and customs that nurtured in him the curiosity, even the willful imperative, to seek out those larger universalities underpinning and bridging the diverse cultures and civilizations. The closeness of Gaitonde's calligraphy to real writing systems appears not to be the exception in his oeuvre, but the rule throughout his artistic evolution. 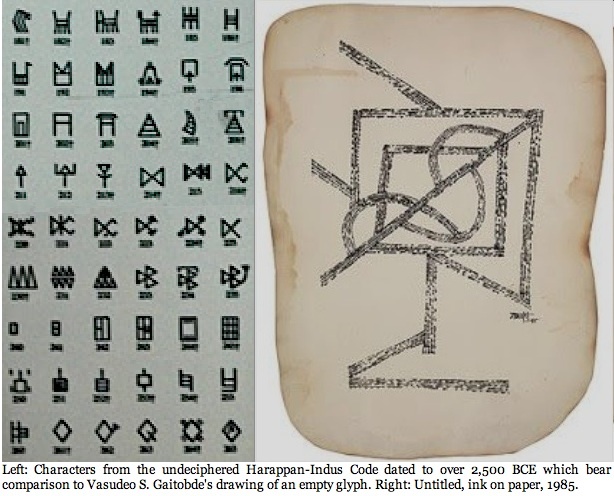 Whether it is Gaitonde's intent to remain close in appearance to authentic alphabets and grammars, or is an exercise in visual rhythms and repetitions, the overall pattern of Gaitonde's art appears to be one of staying close to, without strictly copying, real systems with real meanings and functions. 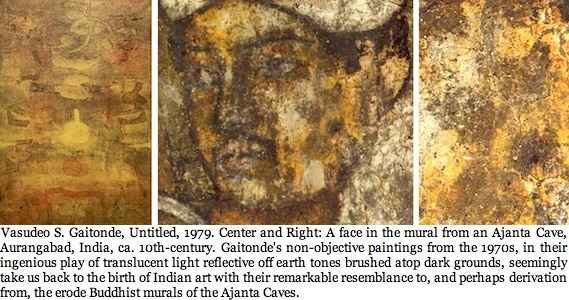 This applies as well to much of Gaitonde's youthful paintings, drawings and prints, whether figurative or abstract, in that they derive visual and conceptual strategies from Paul Klee, and before that, from a virtual compendium of artists -- Georges Roualt, Egon Schiele, Oscar Kokoschka, and Joan Miró. 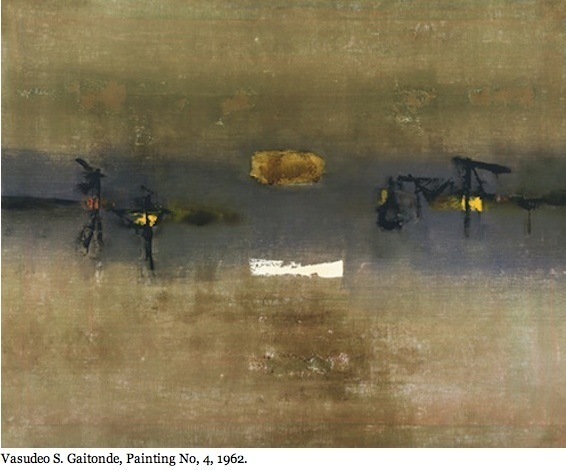 Even Gaitonde's mature work intersects visually with the painting of Mark Rothko and Adolph Gottlieb. Gaitonde seems to have worn and shed his emulations of other artists as if he were putting on and taking off used clothing, knowing such assumptions of styles would not last long but would open up their hidden knowledges to him. The reason for this is too obvious: Gaitonde was expanding his repertoire of techniques, preparing for the moment when he could dress himself in his own brand. And while his painting before 1960 was frequently awkward, stunted, even lurid, his virtuosity from about 196o on justifies the many preparations and rehearsals that readied him for pulling together all the techniques that he learned to become the virtuoso of the scumbled hazes (sfumato) of Gaitonde's 1960s mindscapes and the chromatic shadows (chiaroscuro) of his 1970s and 1980s mindcaves. Whether or not Gaitonde's mimicry of the European and American painters are the reason that the Guggenheim didn't excavate the early half of Gaitonde's career, or if his still earlier period of throwing off the British prerogatives and principles instilled in his education at the JJ School to pursue a post-colonialist-inspired study of Indian miniature painting was deemed too provocative, the museum missed the opportunity to compare these two formative periods of his work. At the very least, we should get to know the Gaitonde who was particularly drawn to the Jain and Basholi schools when they were deemed by the Indian Nationalists of the 1940s to be more properly Indian than the Mughal miniature painting, with its roots in Persian and Arab schools, imposed upon Indian artists throughout the centuries of their colonization. We should certainly come to know the Gaitonde who imparts the Indian sense of space that anyone who has come to know intimately through its architecture cannot ignore -- that is the space that in India is sacred -- 'sacred' in the broadest sense means it elicits an enhanced and enhancing emotional and cognitive equilibrium while sustaining a mysterium facilitating reconciliation with the unknown surrounding and infusing life -- whether it be a reconciliation through aesthetics, science and logic, or a mystical reach for the void. At the same time, if we see in Gaitonde many features shared with Western avant-garde artists, it is because in the 20th century the sacredness of space was imparted to the reflective visual space of art whether in the representational or the abstract composition. Such veneration of space would naturally be a holdover in a more secular age and its arts, albeit converted into a search for the sublime. We sometimes require reminding that Kandinsky converted the sacred Western composition of the Renaissance and Baroque compositions into the abstract spiritual; Malevich transcribed the orthodox icon into Suprematism; Pollock converted the Chinese flinging of ink into the physical, existential action of painting; and Rothko channeled the Native American awe of the cosmos into the rapture attending the contemplation of open monochromatic skies and fields. Now we come to appreciate that Gaitonde channels the painting of India, where the abstract composition had for centuries, possibly millennia, rendered space as a mediative tool. It was in India that the discipline of Tantric meditation in particular issued pure abstract diagrammatic drawings and paintings that might easily be mistaken for mid-20th century non-objective compositions. From Gaitonde's hands (and silent thoughts) the Indian intuition of abstraction, its emptied conduit for higher consciousness, would evolve into the embodiment of fleeting raptures frozen in paint. We are not mistaken when seeing in Gaitonde's later painting an existentialist sensibility -- that is, with a small 'e' so to not confuse his practice with the commitment to a political existence and action as purported by the mid-20th century movement of Exisentialism put forward by Maurice Merleau-Ponty, Albert Camus, Jean-Paul Sartre and Simone de Beauvoir. Sarvepalli Radhakrishnan, the Indian statesman who was also a Vedic scholar, tells us that The Vedas and The Upanishads contain much thought that would become seen as parallel to Existentialism. But then it was such 19th-century proto-existentialists as Schopenhaurer and Nietzsche who found classical Indian literature to be a revelation of possibilities unfathomed in the West. It is no coincidence that it is through Schopenhaurer and Nietzsche that the Existentialists came to incorporate themes found in The Vedas and The Upanishads thousands of years earlier. Nor that the Existentialists in turn inform Harold Rosenberg's view that action painting is existentialist by virtue of its markings on canvas and paper embodying a defiant human will persevering against all adversity. 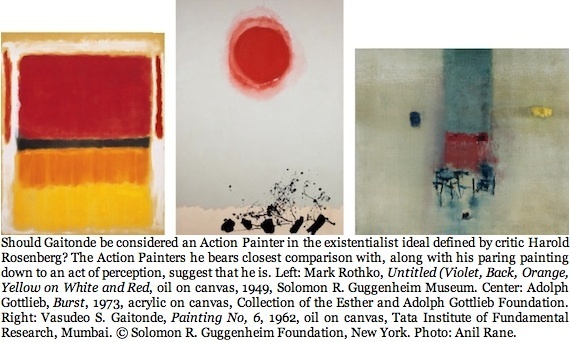 For that matter, a number of Rosenberg's pronouncements made in the "The American Action Painters", written in 1952, fit Gaitonde well in their descriptions. "The canvas became 'an arena in which to act'", Rosenberg wrote, "rather than as a space in which to reproduce, re-design, analyze or 'express' an object, actual or imagined. What was to go on the canvas was not a picture but an event ... Form, color, composition, drawing, are auxiliaries, any one of which ... can be dispensed with. What matters always is the revelation contained in the act ... The new painting has broken down every distinction between art and life." It is not so much that Gaitonde's action as a painter aligns him with both action painting and existentialism. Rather it is the way in which his paintings, by virtue of their presentation of form-in-the-making, lead us to seeing ourselves perceiving the act of perception itself in the existentialist fashion. Or to put it another way, Gaitonde envisions form perpetually forming and unforming, so that his paintings signify not what is seen and interpreted, but rather the act of seeing and interpreting. 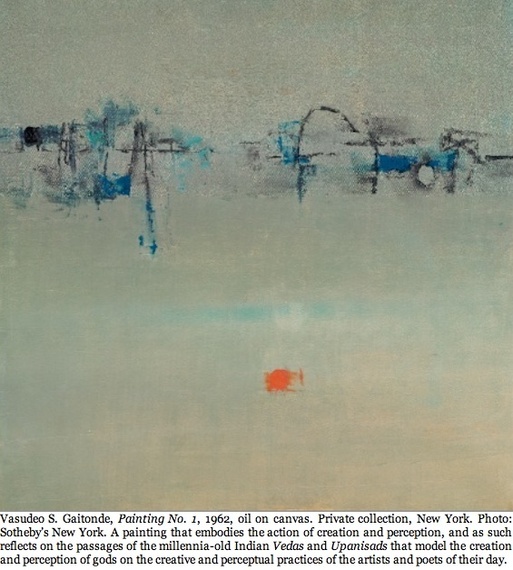 Then there is Gaitonde's trip to New York in 1964 on a Rockefeller grant. It was not yet a full decade after Existentialism had been introduced to the avant-garde in the US. Existentialism dominated the cutting-edge philosophical, literary, artistic, theatrical and left-political activity. Pop Art had not yet displaced action or stain painting. The happenings of Yves Kline, Allan Kaprow, Carolee Schneemann and the Fluxus artists further reduced art to action, with most doing away with painting altogether. The Theater of the Absurd personified by Samuel Beckett in the spirit and memory of Camus' absurdist speculations was prompting imitation throughout the off-Broadway scene. Alain Resnais' film, Last Year At Marienbad, with its repetitive-yet-purposefully unresolved actions penned by screenwriter and novelist, Alain Robbe-Grillet, left thinking audiences startled and frustrated, as did the new films of Ingmar Bergman, Michelangelo Antonioni, Akira Kurosawa and India's own Satyajit Ray. Amid this Existentialist zenith, Gaitonde may not have been willing to be branded a definitive Existentialist for the same reason that he eluded being branded an advocate of Bauhaus aesthetics in the fashion of Paul Klee or as a Color Field Painter in the manner of Mark Rothko. 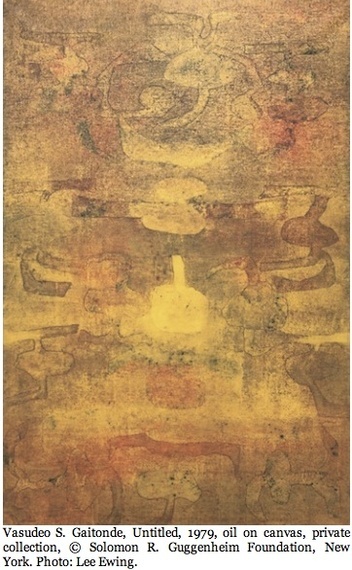 Nonetheless, Gaitonde's development of a painting style that evoked the act of our actively perceiving terrains in the throes of creation or evolution, that is a painting style in opposition to the identifiable and fixed essence of a thing or picture of things, ties him to an existentialist ethos and mythos whether or not he intended it. Rosenberg's description of the action painter who one day encounters the existentialist epiphany particularly describes Gaitonde. "Most of the artists of this vanguard found their way to the present work by being cut in two. Their type is not a young painter but a re-born one. The man may be over forty, the painter around seven. The diagonal of a grand crisis separates him from his personal and artistic past." Gaitonde spoke of himself in similar terms in a 1987 interview that Meera Menezes quotes: "Early on, I did both figurative and non-figurative paintings; I was initially influenced by Indian miniatures. You see, my sense of color was weak, so I started copying the miniatures. Their vivid, vital, vibrant colors attracted me. Soon, to study the colors more closely, I started eliminating the figures and just saw the proportions of colors. I experimented with this because sometimes figures can bind you, restrict your movements. I just took patterns instead. I think that step really marked the beginning of my interest and pre-occupation in this area of painting." What pondering of formalism Gaitonde's art displays has not only a modernist inclination, but an Indian one in being laid down two millennia before the modern era in the Indian Sadanga -- "The Six Limbs" of painting developed by the Indian Buddhist mural painters between 100 BCE and 300 CE. It is from the third-century writer Vatsyayana that we have the six limbs elucidated as 1) Appearance. 2) Perception 3) Form in action 4) Meaningful representation 5) Similitude and 6) Technical virtuosity. The six arms became the guiding principles of centuries of Indian art, such that it is conceivable that Gaitonde's proclivity for abstraction could have easily been born in them well before his acquaintance with Western modernist painting, just as we can say that all artists have a working knowledge of the abstract principles informing the making of their art, however much their compositions are invested with representation. Poddar comes to this turn through Richard Bartholomew, a Burmese critic, painter and poet living in Delhi since his family escaped the Japanese occupation in the late 1930s. In the Guggenheim's catalogue Poddar quotes Bartholomew in a passage that can be taken into context as a principle which Gaitonde heeded throughout his life. "Abstract painting is neither more profound nor more complex than naturalistic or expressionistic painting. One has merely to read an Indian miniature from top to bottom and diagonally to be able to see that though the meaning may be literary, the significance that we derive from seeing the storm sky, the flight of herons, or the grove of blossoming trees, for instance, is only a part of the total vision that we experience. The color scheme and the arrangement of forms, etc., are factors and qualities which constitute the theme, and which the theme, as such, articulates. The 'memorableness' of the miniature is, in fact, an aesthetic experience which is fundamentally and essentially abstract." No doubt it is Gaitonde's instruction in Zen that has enabled him to see that abstraction is, after all, no more nor less than a reflex of the mind turned inside out. In other words, we come to "see" the painting mirroring the human perception and understanding of the myriad gradations and permutations of the world that we at an early age come to apprehend and translate into the language of vision. In this respect, Gaitonde's paintings imply the process by which in abstraction we habitually formulate, stabilize, manipulate, and finally articulate form in the mind from its raw and protean materiality into a potentially infinite system of meaning. The effect is a painting that traces the rhythm of seeing, the vibrations of light hitting the retina of the eye before the brain has received the information and made it a clear and distinct vision. We are presented with the shimmering light as if it has already been filtered through the eye of the viewer in its instantaneous yet varied ebbs and flows, its glimmers and pulses, its chromatics and delineations -- all of which is then really filtered by the viewer. Finally it is Gaitonde's deference to the informe that results in the earliest meeting of nature with the mind (that is the mind made by nature) -- as if we are newborns, or waking up in those seconds before consciousness takes hold. This is the informe that informs abstraction before abstraction is rationalize as the regulation of form. The informe only becomes the concept of abstraction when our vision forms a lucid picture -- that is, the build up of habitual and familiar seeing over time -- that gives us reason to believe that we are seeing a representation of the world in terms of real forms. Of course, as Bartholomew pointed out (above) this is something even the realistic figure painter knows intuitively, as the realist builds the illusion of reality with a mesh of successive abstractions that together compose a resemblance. Ironically, no one understands abstraction better than the artist devoted to rendering or embodying that pictorial or sculptural work of art that we by consensus call realism, and for this reason Gaitonde's early realist painting would have been a valuable asset to his Guggenheim retrospective. 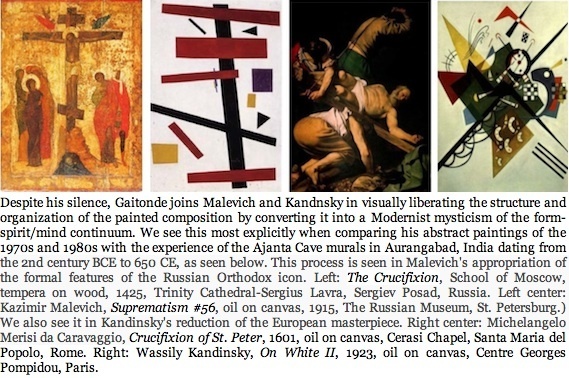 Whatever the reason that the Guggenheim chose not to focus on Gaitonde's early figurative studies, we can only lament that his evolution as an artist wasn't accorded the same regard paid to Kandinsky's pre-abstract figurative art in that artist's Guggenheim retrospective some years earlier. We can be grateful, however, that the museum presents three distinct bodies of Gaitonde's work that assimilate not only Euro-American and Indian modernist aesthetics and metaphysics, but as well those of the Chinese, Japanese, and Persian, and again, the conceptual ideologies that Western thought absorbed from The Vedas, The Upanishads, The Bagavad Gita, The Ramayana, and The Law of Manu, much of which was absorbed by Europeans and Americans earlier mentioned, some without their knowing it. All of these crosscurrents among the many cultures brought with them partial- or wholly-abstract renderings that are obvious outgrowths of a more basic, if not a primal, abstract principle. That principle can be seen having first matured in the 1962 series of paintings by Gaitonde that invoke a primordial emergence from the mists and waters of creation. Most viewers are likely to recognize the compositions to be pictorial, while asking whether they are renderings of trees? rocks? buildings? machines? We can only say for certain that these compositions by Gaitonde seem no more assured than, yet just as evocative as, mirages in a desert or at sea -- the tricks our eyes play when sensorily and nutritionally deprived. When I look at specific paintings from Gaitonde's 1962 numbered series, most prominently Painting No. 1, Painting No. 3, and Painting No. 4, I am made to think of individual histories of human perception, but also of the creation myths that so many early world cultures left behind. Perceptually, one may be a primordial emergence of form. Another may be a departure of form into shadow. But when conformed to the mythopoetic urge of individuals and societies the mythological takes precedence in the interpretation. Now one painting may appear as the beginning of worlds. Another one may appear as the end of times. Such metaphorical and mythological correspondences are significant, for they align Gaitonde with that other art of emergence and departure that Indians mastered in words long before most other cultures and nations today emerged. The creation narratives of The Vedas and The Upanishads in particular are masterpieces in large part because within them we find a principle of abstraction presiding over the reconstruction of personal, infantile memories, or perhaps memories of dreams-in-formation. Either way, the creation myths describe those universal first apperceptions of the world apart from and distinguishable from us. As such the creation myths simply enlarge and universalize the infantile first recognition of the difference of the self and the world containing us. A world that we all learned to distinguish, yet to which we attached, at first, our own imaginative meanings, and later the dominant mythologies of the culture within which we are formed. For as written accounts, the creation myths alert us as to how deeply and profoundly the ancient mind was aroused by, and became cognitively fluent in, the observations in nature of the minute gradations of form that can be imitated through the expert modulation of words and images, and from there commandeered into a literal and theoretical language of analogy. Gaitonde's exercise of perceptual objectification -- that is the eye's taking in of a new and unfamiliar world for the first time -- is an idea that has been expressed in the creation myths of the world, but perhaps never as exquisitely as in those passages of The Vedas offering glimpses of an imagined prehistory of civilization so ancient as to be without specific time and place and so introverted as to unite the individual with the whole of being. It is a view that professes a mystical yet intimate continuity and reciprocal interchange between the cosmos and the human body. But it is the kind of mysticism that lends itself easily to the secular and scientific mind, as it isn't only a metaphysical model, but as well a primitive paradigm informed by a study and mimicry of the processes of human perception and consciousness of physical form in formation and deliquescence. Gaitonde's Painting No. 3 is one of those that imply that the creation myths of the world are no more nor less than an anthropomorphic projection of the protean power of artists onto the world. The authors and painters and sculptors and musicians and dancers throughout history who fashion morphologies -- that is, meaningfully recognizable forms -- seemingly from nothing: they are our subjects in the creation myth as much as any omnipotent creator. It is both enticing and relevant to imagine that Gaitonde, as an Indian, provides for Indians and non-Indians alike a link to what may be the oldest creation myths extant in The Rig Veda. Gaitonde's seminal paintings of the 1960s summon to mind such narratives as the emergence of materiality from the mists and waters of eternal creation by virtue of their evocation of painted forms emerging literally from nothingness but the direction of the artist's mind. Consider this passage from The Rig Veda as a metaphysical speculation on abstraction, the emergence of artistic creation. At first was neither Being nor Nonbeing. There was not air nor yet sky beyond. What was wrapping? Where? In whose protection? Was Water there, unfathomable deep? There was no death then, nor yet deathlessness; of night or day there was not any sign. The One breathed without breath by its own impulse. Other than that was nothing at all. Darkness was there, all wrapped around by darkness, and all was water indiscriminate. Then that which was hidden by Void, that One, emerging, stirring, through power of Ardor, came to be. -- Rig Veda, ca. 2000-1700 BCE. Translation, Raimundo Panikkar. What is such writing but the description of an artist in the throes of discovery, interpretation, conceptualization and production? How can a deity who creates the world be anything but an artist adept at abstraction and articulation? Thus, in the beginning the world was only self, being, essence -- whatever terms suit the ideology at hand -- yet which explains the shapes, tones, light and shadow that come into being. Had he lived another decade, Gaitonde would have watched India become an economic player in the postindustrial world, and thereby a thriving center for the development of new artistic innovations. Today international tastes are being redefined as much by artists, collectors and institutions aggregating in Beijing, Shanghai, New Delhi, Mumbai, Tehran, Abu Dhabi, Dubai, Cairo, Buenos Aires, Rio de Janeiro, Mexico City, Tel Aviv, and Johannesburg -- some in defiance of authoritarian governments. Even more remarkably, over the last decade these new markets have made history for not directing their gaze upon historical and contemporary artists from the Western art centers, but rather onto the indigenous artists, both contemporary and historical, who reflect their own cultural and social legacies and innovations. The new collectors around the globe, nourished by decades of cultural cross-fertilization and fortified by a steady stream of capital, are both ready and patient enough to invest in significant local artists who have until now been under-appreciated or entirely neglected in the global market for art. The author wishes to thank Jesal Thacker of The Bodhana Arts Foundation and writers Meera Menezes, Roshana Shahani and Krishen Khanna, for pointing him in the directions required for this commentary. On December 18, 2014, the author added the above acknowledgment.